At RVB Associates, we shape leadership talent enterprise wide, in groups and teams and individually. We develop leaders enterprise wide by identifying core business priorities, the required knowledge and competencies to achieve them. Our development process is designed for real-world demonstration of desired practices. Our development designs use proven, research-backed methods. We identify required business outcomes and then examine a team’s assets and liabilities that support and challenge successful achievement of them. We identify individual leader required knowledge and competencies compared to actual. The coach, sponsoring manager and client collaborate on the required engagement outcomes. All RVB coaches are published and hold doctoral degrees in human development. Cultures of Voice exist when employees are safe to express themselves and make suggestions to change. The Silence Voice Index™ (SVI) for the enterprise and for the individual leader are ground-breaking diagnostics that show the level of risk associated with Cultures of Silence and Cultures of Voice. Cultures of Voice are required for innovation, rapid knowledge transfer and new thinking for problem-solving effectiveness. Cultures of Silence impede the upward flow of important work-related information that can lead to operational, fiduciary and reputational risk. The research-based, 30 item diagnostic, helps leaders identify the practices they should master to shape and sustain a Culture of Voice and eliminate Cultures of Silence. The SVI Enterprise diagnostic measures the strength of the collective Silence/Voice culture. Data analysis shows which of the four silence types and voice practices contribute most to the overall company Silence/Voice Index. Senior leaders are then able to determine specific priority business area(s) and leadership practices for development. The SVI individual Multi-Rater diagnostic provides leaders with confidential feedback from multiple sources on the impact of their practices and the result on silence or voice cultures. Leaders then prioritize specific development actions to create and sustain a culture of voice. An optional composite report shows combined business unit Silence/Voice indices for a high-level organizational perspective. Leaders can choose to use expert coaches for confidential support in interpreting results, identifying root causes and creating priority development actions and success metrics that have the highest likelihood of moving toward a culture of voice. 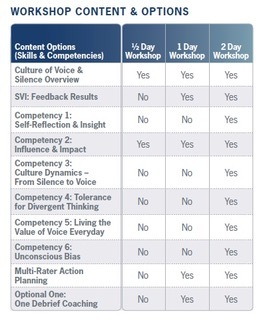 The Cultures of Voice Workshops strengthen leaders’ abilities to shape Cultures of Voice. Each leader learns to identify the Signs of Silence and demonstrate practices that are known to encourage voice and minimize the withholding of valuable work-related information. Leaders improve their tolerance for divergent thinking, use build-up language and apply root-cause current state analysis that encourage idea generation and expression. Leaders learn the dynamics of employee cultures and the influence they have to shape productive Cultures of Voice. RVB Associates also offers onsite workshops to help shape your corporate culture. The one and two day workshops use the SVI diagnostic data for development action planning that results in sustained Cultures of Voice. Set your team apart with these interactive and informational seminars that will not only provide professional development but team building opportunities.